On Thursday, November 17, 2011, 20 top students from the Academy for Advanced Academics (at FIU), Felix Varela Senior High School, John A Ferguson Senior High School were chosen by their teachers to participate in the Caribbean Challenge at the Green Library at FIU. The students learned about the Digital Library of the Caribbean and Analyzing Primary and Secondary Sources from Miami Dade teacher Daniel Vinat and dLOC Coordinator Brooke Wooldridge. They participated in a roundtable discussion with FIU historian Sherry Johnson, Special Collections Librarian Vicki Silvera and African and African Diaspora graduate student Felix Jean Louis. Finally, the student teams worked with the key dLOC resources in the bookshelves below selected by FIU Latin American and Caribbean Center graduate student Pierre Losson. They had one hour to read, interpret and prepare a five minute presentation of their findings. All of the presentations were excellent, but the honorable judges FIU Librarians Gayle Williams and Adis Beesting and FIU Latin American and Caribbean Associate Director Liesl Picard selected the group on Panama as the overall winner for their ability to place Panama in the international context, well-coordinated presentation and clear description of the primary and secondary sources. 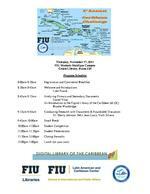 The event was co-sponsored by the Digital Library of the Caribbean, FIU Libraries, FIU Latin American and Caribbean Center and Miami Dade County Schools. We owe a special thanks to the County District Supervisor for the Curriculum and Instruction Division of Social Sciences and Life Skills at Miami-Dade County Public Schools, Bob Brazofsky, for his support of this event and the funding to make it possible for the teachers to participate in this important experience. Most of all, we thank Daniel Vinat for the vision to develop this project and John Burkowski, Diana Nadaskay, Carlos Ardaya for being excellent teachers and providing their students with exceptional opportunities both inside the classroom and in the community. Check out this resource packet if you would like to recreate the Caribbean Challenge in your classroom. The full resource packet includes the overview, program, presentation slides, team presentation score sheet, evaluation template, and certificate template. No bias, no viewpoint Only your interpretation Can give additional information Materials Textures Printing methods Technologies Why do we use primary sources in history? No interpreted in any way. For example, A picture of King coffin printed in a book or posted on a website can be considered a primary source. **Look for source*** Does a Primary Source have to be the original material? An informational source that analyzes the event. These sources often use several primary sources to compile the information. Biographies Encyclopedias History books Textbooks What are Secondary Sources? Yes They provide the necessary background or context to be able to interpret Primary Sources For example, World Book 2005 or your Social Studies textbook can provide background information about the events leading up to Revolutionary War. Are Secondary Sources useful? Ask yourself some questions: How does the author know these details? Was the author present at the event or soon on the scene? Where does this information come from personal experience, eyewitness accounts, or reports written by others? Are the author's conclusions based on a single piece of evidence, or have many sources been taken into account? How do you know? Newspaper and Magazine articles can be a primary or secondary sources. If the article was written at the time something happened, then it is a primary source. Example: The articles written on are primary sources. However, if a reporter in 2009 wrote inauguration using information written by someone else (1789), that would be a secondary source. Primary or Secondary Sources? (note that Encarta lets people edit its pages but with editor approval) Upon completing college, [Bush] became eligible for the military draft. To meet his service obligation, Bush enlisted in the Texas Air National Guard in 1968. He told the admitting officer that he wanted to become a pilot like his father, who was a highly decorated Navy flier in World War II. He did his basic training at Lackland Air Force Base in Texas, and entered a pilot training program at Moody Air Force Base Georgia. He received favorable reports from his superiors, attained the rank of second lieutenant, and was certified to fly the F 102 jet fighter during training missions in the South and along the Gulf Coast. the F 102, and instead notes patriotically how President Bush wanted to fly a jet like his father. What is going on in this photo? What questions does it raise? CARIBBEAN CHALLENGE 2011 Evaluation 1 How much did you know about the Caribbean before today? ____A lot ____Some ____Nothing 2. How much do you know about the Caribbean after today? ____A lot ____Some ____Nothing 3. What was the most important thing you learned today? 4. How will you implement what you learned today in your classes? 5. What did you like the most about this event? 6. What would you change for future events? 7. Was this your first visit to FIU? 8. Do you plan to go to college? 9. What would you like to study?